New York: Alwar Balasubramaniam’s work is currently being displayed in two concurrent exhibitions up at Talwar Gallery’s spaces in New York and New Delhi. While the Delhi exhibit, titled Nothing from My Hands, is showing new work by the artist, the New York iteration comprises a suite of six works that date from 2008 to 2012 and represent a variety of mediums in which his practice has been manifest. 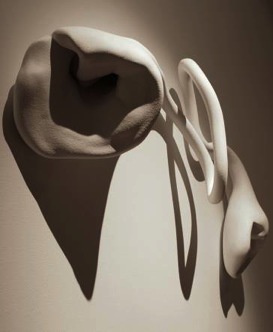 The New York exhibition is installed chronologically, and so the first work I encountered was the seminal 2008 piece, Kaayam – a row of four fiberglass sculptures installed on the wall, fabricated using the artist’s signature technique of casting molds of his own body. The bodies here, however, are crumpled and emptied of volume leaving only the outer skin that falls fluidly, almost giving the perception of a wraithlike body flying across the wall. Although absolutely exquisite in construction and aesthetically striking, my strongest response to the work was visceral. By inserting himself and the human body in this installation, the artist succeeds in engaging the viewer on an emotional level. His work becomes personal to the viewer, as do the questions it provokes – questions of what is present, yet invisible in all of us. The artist repeatedly refers to this concern of capturing the invisible and traces of the past in his TED talk in November 2009. A second work, Link from 2009, in this show brought this concept home for me. Link is a string that has been stretched horizontally from one wall with a fishing hook at the other end that is suspended in midair. It is a quiet work, minimalistic in its presence, and easy to miss, which I almost did. But once you happen upon it, it is compelling. The curiosity of what holds the hook aloft midair (spoiler alert: there are magnetic plates involved), and the play of shadow from the string is oddly mesmerizing, making viewers pause and reassess their understanding of space, gravity and their boundaries, which we experience and witness daily. The remaining three works in this exhibition are from 2012, and continue Balasubramaniam’s engagement with the unseen or the intangible and his rejection of the construct of polarizing opposites like light and dark, shadow and form. In Hold Nothing, he uses a cast of his body to create what appears to be a coiled channel between two portals. It is easy to read this as an analogy of the human body. But what I found interesting was how Balasubramaniam has in fact abstracted figural forms in his new work, building on his existing oeuvre. 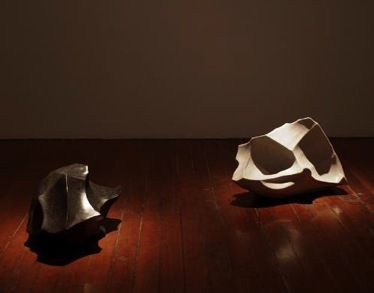 Process and technique remain key to the viewing experience as with his earlier sculptural and two dimensional works, even as the question of perception and traces that drive his work seem no longer to be captured in absentia as much as actualized. This is also seen in the work Lines in Fold. As the title suggests, this works follows the lines and folds formed by the artist’s closed fists. Carved in unyielding sandstone and granite, this shift in medium is accompanied by an inversion of the content of his sculpture. The inside, so far represented in his oeuvre as absent, is now present and visible, making the skin or the physical layer between the inside and outside redundant. This continuum is also evident in Balasubramaniam’s new metal sculptures, which unfortunately were not on view at Talwar New York. They are, however, on exhibit at Talwar Gallery in Delhi. If you are intrigued by the interface these works create between you and the white gallery walls, watch this video.